The airframe portion of SCP-2918. Picture taken at ██-█████ AFB before relocation. Special Containment Procedures: SCP-2918 is stored in hangar 2 at Foundation Site-19. The control panel should be monitored for new messages every 24 hours at a minimum. The airframe of SCP-2918 is to be stored unfueled and unarmed at all times. Regular psychiatric evaluations are to be administered every two weeks by Dr. █████, a specialist in child psychology with experience in anxiety treatment. Description: SCP-2918 is an incomplete MQ-1 Predator unmanned aerial vehicle suite, consisting of one airframe, one ground control system (GCS) and one primary satellite link communications suite (currently disabled). The GCS is configured into four cockpits to communicate with up to four airframes, but burn damage and ordinance fragmentation has rendered three out of four cockpits inoperable. The remaining control suite, designated A2, communicates via wireless tactical data link with the only remaining drone. SCP-2918 is capable of generating messages on the GCS systems monitor, and has displayed significantly enhanced feedback control. The system has been observed as communicating its diagnostics in simple English, occasionally producing visual aids in the form of bitmap images. The nature of these messages imply that the airframe is self-aware. Foundation testing has placed the airframe's intelligence and emotional maturity as on par with that of a 10-12 year old child. SCP-2918 is largely docile, but displays symptoms of anxiety and post-traumatic stress disorder, including nightmares and flashbacks. Aside from its apparent sapience and ability to communicate, SCP-2918 displays no anomalous properties. 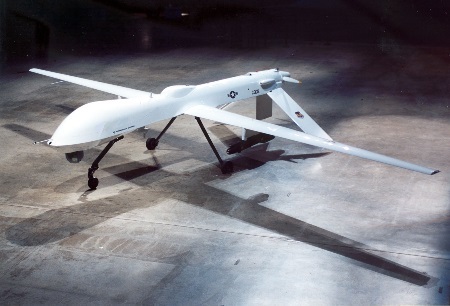 The drone is an MQ-1B Predator of unmodified build with standard hardpoints for payload delivery. SCP-2918 was brought to the Foundation's attention following incident SCP-2918-Kato, during which the airframe, while under the control of USAF personnel, refused to respond to commands and attacked its own operators. In the process, the GCS was damaged, and the other airframes eventually crashed, not being able to receive commands to return and being unable to refuel. Their wrecks displayed no anomalous properties, and were eventually scrapped. Though SCP-2918 has not displayed any independent motion since incident SCP-2918-Kato, it is stored unarmed and unfueled as a standard safety precaution. No experimentation involving fueling SCP-2918 is to be undertaken at this time. Note: All psychiatric interviews are conducted through the GCS control panel. As such SCP-2918 is rendered as UAV-A2 and Dr. ████ is rendered as PILOT-A2. PILOT-A2: How are you feeling today? PILOT-A2: Captain Kato is safe. What were the dreams like? PILOT-A2: No, you did not. PILOT A2: Your dream was what we call a flashback, 2918. You were reliving a trauma from the past, but that doesn't mean it's real now. PILOT A2: Would you like to draw pictures today? Interview dated 19 ███, 20██, two days after SCP-2918 displayed anomalous properties. Interviewer: Researcher ████, a prior service member and Foundation personnel stationed at a nearby AFB. Interviewed: Captain Derek Kato, USAF drone pilot. Researcher ████: When did you first begin to recognize 2918's anomalous properties? Researcher ████: Please clarify for the records. Kato: Listen, you work on these things for twelve-plus hours a day, for weeks. Sometimes months. We would talk about them like they were people. Researcher ████: Why would you do that? Kato: Boredom, mostly. You're stuck in the GCS for 12 hours a day. You get familiar with the machines over time, and you start uh… Refresh my memory. What's the word for when you assign human characteristics to something? Kato: Sure. You start treating them like people. B2 had a slight crook in the wing, not enough to render it INOP but enough that you had to compensate for it when you were turning. So we called him a grumpy old man, like he had a gimp foot. Stuff like that. Researcher ████: So you and your fellow pilots assigned personalities to the drones? Kato: Not intentionally. We'd just kind of complain about them, to be honest. Heh. You know, A1's lagging a little, he wants to do his own thing again. B1's camera is off, she wants to have a kodak moment with that sunset instead of the hajji1 we're after. Researcher ████: What personality was assigned to airframe A2? Kato: Innocence. For one reason or another, A2 always got less action than all the other drones. We eventually started joking about her being a virgin or a little girl. Researcher ████: Did the system display any anomalous properties before the event? Kato: Like I said, they had their own problems. We didn't think it was out of the ordinary. Well, except maybe that we weren't putting enough effort into maintenance. Most crews wouldn't let a crook in the wing or a laggy turbine go on for so long. But we just chalked it up to a high ops tempo. The Colonel wanted us to take them on missions practically every day. Barely enough time for us to sleep and eat and refuel. Then we'd be back up. Researcher ████: Can you describe for us the events on 17 ███, 20██? Kato: Yes sir. On the 17th we undertook a night mission in ███████. We were looking for an insurgent leader in the area. Our night monitoring was poor, but we believed we had found him in the presence of several civilians. We asked for mission clarification, and were told to proceed regardless of the civilian presence. At the time, I was operating airframe A2. She refused to fire. Researcher ████: When you say refused, you mean…? Kato: I issued the command to fire and airframe A2 did not fire. All systems displayed green and there was no mechanical failure. I issued the command to fire a second time and A2 still refused. We shuffled tasking and I began to return her for maintenance while B2 took the shot. B2 confirmed casualties on the ground, at which point we realized several of the dead were children. Kato: A2 began to accelerate on its return even though no command had been issued to do so. It continued to accelerate well beyond safe flying speeds. We had taken nearly 90 minutes on approach, and A2 made the return journey in 45. While A2 was returning, we analyzed the ground and realized that our target was not among the casualties. At this point we began to call into doubt whether or not he had even been present at the location. We radioed up to command post asking for further details and mission instructions, and were ready to declare the mission a total failure. At this point, A2 completed its return journey but refused to slow when given commands to do so. Kato: A2 fired two Stingers at the GCS. One impacted the cockpit for B2 but did not detonate, killing the pilot instantly. The other landed nearby and detonated, wounding 2nd Lieutenant ███, the pilot for B1, and 1st Lieutenant ███████, the pilot for A1. I removed the pilots from the GCS, which had caught fire, while requesting medical attention for the wounded. A2 landed itself on the strip with no input while medical and fire personnel put out the GCS and began to treat the wounded pilots. Kato: ███ lived. ██████ did not. Researcher ████: No further questions at this time. Thank you, Captain. Closing statement: Captain Kato was treated with class-B amnestics and soon received an honorable discharge from military service. His chain of command and personnel involved in taking his statement were also issued class-B amnestics up to Brigadier General ███████, who is to monitor missions for further deviations of this nature and report them to Foundation personnel if discovered. Message received from SCP-2918, dated 27 ███, 20██. This date coincides with Captain Kato's date of honorable discharge. 1. A term for a Muslim who has completed the Haj, the pilgrimage to Mecca. Used in military parlance to refer to anyone from the Middle East.